CNOC are hosting a leinster league event this Sunday on a new map in Dunmore woods. Starts from 11a.m. to 1.00p.m., course closes 2.00 p.m.
Leg cover recommended for light green courses up. It is very wet! You will be muddy! aurel adds additional challenges in some areas. The River Nore flanks the map to the east with the River Gully traversing the map, STRICTLY crossable only at bridges. This is a protected river and special area of conservation, one of the few remaining areas for the freshwater Pearl mussel. Please be considerate of other forest users. Parents please remind your children of water safety, the Junior courses are away from rivers except at bridge crossings. Rivers are high, remind children not to lean over the sides of the very, very, old bridges! 2017 by Conall Whelan (mostly before storm Ophelia). There may be some additional fallen trees! Due to recent extreme weather conditions in Laois water holes, drains etc. are currently larger than mapped. Take care. Access: Please access forest/parking from R434 to prevent any build up of traffic on the N77. The Wood is towards the end of the road. If the parking is full the parking officials will wave you on to either Dunnes garden centre or the G.A.A. pitch which you have already passed! The Wood is towards the end of the road. If the parking is full the parking officials will wave you on to either Dunnes garden centre or the G.A.A. pitch. Extreme overflow parking at G.A.A. pitch which is 1 km walk away- just in case!). Refreshment available locally (in order of distance from event!) at Castlewood Organic farm, soup, cakes etc. (Also organic meats, apple juice etc. for sale) opposite garden centre. Castle Arms hotel -carvery lunch, in village. Lawlors (near bank) and Gala (on the green) for a sandwich to take away. Castle Durrow (once you've cleaned up) for a treat! bbeyleix have a couple of cafés, a hotel and supermarkets with deli counters too. xtensive range of Christmas trees, seasonal planters, bulbs, bare root trees etc available at very reasonable prices! Please support. 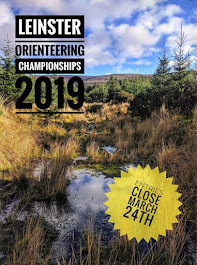 you enjoy a rare orienteering opportunity in Laois! CNOC are also looking to buy some new club gear we will have new designs to be looked at on Sunday. Please ask to see them if you are interested. The final event of the summer series (not part of the league) is our annual Score event and Barbecue in Hollywood, next Tuesday 20th June. Parking is outside the two pubs and is not plentiful, Please don't obstruct gates, or other traffic, and if necessary please park down the road by the church or the school. Registration and download outside Tutty's pub. Start and Finish are 400m up the road at the forest entrance. Please don't forget to download. This is the 5th event of the Summer series and is the final one to count to earn league points. Parking and registration is in front of Lumville House and the start is 600 metres from registration– approx. 5 minute walk. Start times are from 6:30 to 8:00 and courses close strictly at 9:00. Location will be posted from Junction 12 off the M7. Hire of SI cards €2. If any large group is coming advance information on names etc.. would be very useful to speed up registration. The next event in the series is an Urban Sprint (on a newly designed map) which takes place next Tuesday (6th June) in Newbridge, Co. Kildare. Assembly and parking in Ryston Sports & Social Club. There will be two registration points, one in Ryston and one at the start which is near the main bridge at the top of the Linear Park (for those who will not be driving to the event). Start times from 6.30pm to 8:00pm. Courses close at 9:00pm. This event will take in the local parks and their surrounding areas and is being run in conjunction with the local Newbridge June Fest festival so a good crowd is anticipated. All beginners looking to try it out don't worry we will have plenty of club members on hand to show you the ropes. The league table is now available on the Irish Orienteering Website, click below to see how you stand! The next event in the Summer Series takes place next Tuesday night (23rd) on our urban Naas map. The event is planned/organised by Eileen Loughman and Kevin O'Boyle, and promises to be a good evening out for all the family. Google Maps: https://www.google.ie/maps/place/53.1280833,-6.7942663Signposted from : Exit 12 on the M7. Its that time of year again when we head for the short grass, concrete, and forests of Kildare and West Wicklow for the annual CNOC summer series - commencing next week (Tues 16th) on the Curragh at Sunnyhill. This years Summer Series consists of 5 competitive events, and a sixth fun event (including BBQ) at Hollywood on the 20th. For purposes of calculating league positions, we'll use the standard scoring system for leagues on orienteering.ie, with the best 4 of 5 events to count. There will be prizes for the top three men and top three women on each course, and a small prize for all juniors that complete 4 events. Prize-giving will take place at the BBQ in Hollywood. As per usual, all the events have three courses of offer (Adventure/Medium/Long)If you plan on bringing a large group to any of the events, advance warning is appreciated so we can ensure we have enough maps, etc.. Thanks for reading, and hope to see you all over the next few weeks.